The Place Dazzling Café may be closed for now in Singapore but there is a new concept Botany by Dazzling Café . Located by the river in Robertson Quay close to Beast & Butterflies, Botany is run by the same team behind Dazzling Café, Serene, Cassandra and local actress Julie Tan who is also Cassandra’s cousin. Characterized by marble table top and lush interior in line with the name, the restaurant and café’s interior is cosy with full glass pane, where you can expect a good amount of natural light in the day. There is some slight affiliation to Dazzling Café with some of the dishes like the toast which is on the menu at Botany, though I would say that the bulk of the menu at Botany spots a new theme of wholesome and soulful food at affordable prices. The Food There’s no dominant cuisine on the menu, but rather expect a mix of east and west dishes with the aim of trying to provide healthier options and better ingredients with no MSG or preservatives. For a start, I had a mix of Otah Chips (S$15), Signature Mentaiko Fries (S$15) and the Taiwanese Chicken Bites (S$13). It all sounds quite unhealthy, but the team does emphasize the use of healthier ingredients such as olive oil in preparing the fries. Well, it is all about relativity. My top picks for the sinful treats are the Otah Chips, where the fresh mackerel is coated with a batter then fried to a crispy texture; as well as the addictive Taiwanese Chicken Bites which reminds me of the flavour from the night markets in Taiwan. For something healthier, there are options like the Botanist Salad (S$15) or Curried Cauliflower Soup (S$10), where you can opt to add on meats for the salad. As for the curried cauliflower soup, I am personally not a fan of it as it tastes too healthy, coming across as too bland for me even with the curry element. For mains, I had the Grilled Boneless Chicken with homemade Balinese Salsa (S$18). It looks like a simple plate of chicken dish with rice and sunny side up egg, where the chicken leg is tender with a crispy skin. Go with the salsa sauce to pack more punch into the meat, though it is quite tasty even without the sauce. On meats, the Pan Seared Barramundi ($26) with pesto sauce and mash potato is another healthier option on the menu. I feel that the flavour of the fish is too bland, possibly due to the light seasoning. That said, the restaurant does provide condiments by the side such as Himalayan salt and pepper if you fancy a stronger seasoning, which really differs for everyone. 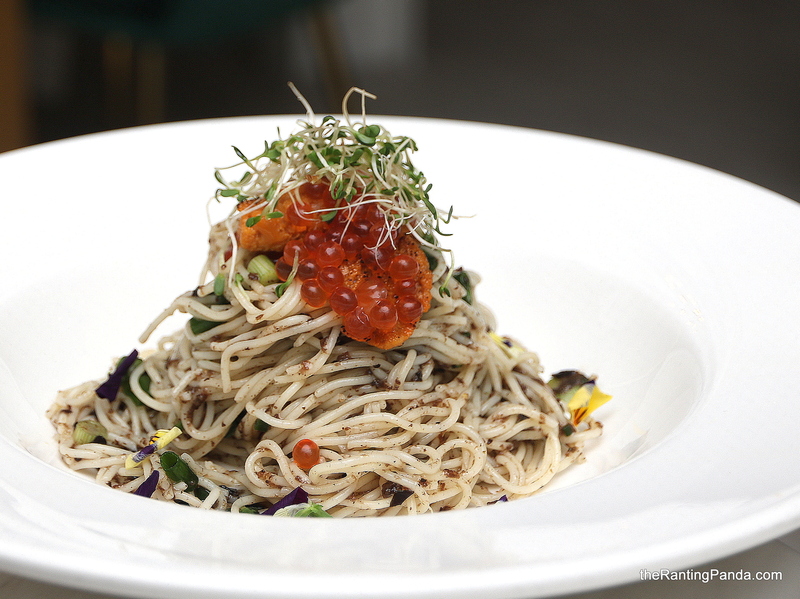 For pasta, one of the signatures here is the Uni Truffle Spaghetti (S$28), which features a luscious combination truffle salsa, Japanese sea urchin, and salmon roe with cold-rinsed capellini. It is a divine combination, though my preference is for the kitchen to go easy on the truffle element which overpowered the pasta and sea urchin. The must try dish for me at Botany is surprisingly the Mapo Tofu with minced chicken. This is a vegetarian dish, which might raise eyebrows with the minced chicken element. The Mapo Tofu Rice Bowl (S$18) here is prepared with the latest food trend now by Impossible meat, which means no real chicken meat is involved here. The spiciness could be elevated here, though I enjoy the silky tofu and rice on its own. If you are a steak lover, go for the Australian Grass-fed Ribeye Steak (S$28 for 250g), one of the most affordable steaks of this quality in town. The steak is quite succulent, and for the price, it is a good means to load up on some post workout protein. For desserts, there are traces of Dazzling Cafe on its menu such as the signature Honey Toasts, with options like Banana Chocolate, Strawberry Lover, and limited edition flavours, such as Avocado Chocolate Toast (S$18). Rants I was expecting a stronger theme of dishes linked to the name of Botany on its menu. While the choices of dishes are varied, it could also come across of lacking some character which I feel is vital to any food concept. Will I Return Again? For the Robertson Quay precinct, the prices of the dishes at Botany by Dazzling Café are surprisingly affordable. The cafe is still in its early days of operations where feedback from diners are taken, and there is definitely still some fine tuning to be done on the dishes. Granted, it is a nice space to catch up with friends in Robertson Quay if you are looking for a cafe which emphasizes on healthier and premium ingredients.